IF you pick up a copy of the debut novel by Nigerian, US based writer, Myne Whitman, you will be thrilled by the cover which is very classic and will definitely make you believe you are reading a copy of a romance from a western author but when the popular streets of Lagos and Nigerian names start coming up, you will be forced to turn the back page to know who the author really is; the name definitely is not Nigerian you may say but the author is 100 per cent Naija. 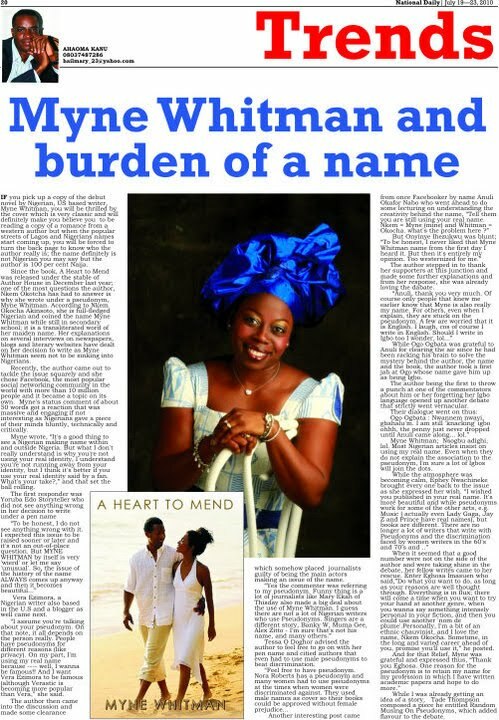 Since the book, A Heart to Mend was released under the stable of Author House in December last year; one of the questions the author, Nkem Okotcha has had to answer is why she wrote under a pseudonym, Myne Whitman. According to Nkem Okotcha Akinsoto, she is full-fledged Nigerian and coined the name Myne Whitman while still in secondary school; it is a transliterated word of her maiden name. Her explanations on several interviews on newspapers, blogs and literary websites have dealt on her decision to write as Myne Whitman seem not to be sinking into Nigerians. Recently, the author came out to tackle the issue squarely and she chose Facebook, the most popular social networking community in the world with more than 10 million people and it became a topic on its own. Myne's status comment of about 50 words got a reaction that was massive and engaging if not interesting as Nigerians gave a piece of their minds bluntly, technically and critically. Myne posted, “It's a good thing to see a Nigerian making name within and outside Nigeria. But what I don't really understand is why you're not using your real identity, I understand you're not running away from your identity, but I think it's better if you use your real identity said by a fan. What's your take?,” and that set the ball rolling. Vera Ezimora, a Nigerian writer also based in the U.S and a blogger as well came next. “I assume you're talking about your pseudonym. On that note, it all depends on the person really. People have pseudonyms for different reasons (like privacy). On my part, I'm using my real name because ---- well, I wanna be famous!! And I want Vera Ezimora to be famous (although Verastic is becoming more popular than Vera,” she said. The author then came into the discussion and made some clearance which somehow placed journalists guilty of being the main actors making an issue of the name. Tessa O Doghor advised the author to feel free to go on with her pen name and citied authors that even had to use male pseudonyms to beat discrimination. The author stepped in to thank her supporters at this junction and made some further explanations and from her response, she was already loving the dabate. While Ogo Ogbata was grateful to Anuli for clearing the air since he had been racking his brain to solve the mystery behind the author, the name and the book, the author took a first jab at Ogo whose name gave him up as being Igbo. The author being the first to throw a punch at one of the commentators about him or her forgetting her Igbo language opened up another debate that strictly went vernacular. Myne Whitman; Nsogbu adighi, lol. Most Nigerian articles insist on using my real name. Even when they do not explain the association to the pseudonym, I'm sure a lot of Igbos will join the dots. When it seemed that a good number were not on the side of the author and were taking shine in the debate, her fellow writes came to her rescue. Enter Eghosa Imasuen who said,”Do what you want to do, as long as your reasons are well thought through. Everything is in flux; there will come a time when you want to try your hand at another genre, when you wanna say something intensely personal in your fiction, and then you could use another 'nom de plume'.Personally, I'm a bit of an ethnic chauvinist, and I love the name, Nkem Okocha. Sometime, in the long and varied career ahead of you, promise you'll use it,” he posted. While I was already getting an idea of a story, Tade Thompson composed a piece he entitled Random Musing On Pseudonyms, which added flavour to the debate.